Dwelling is funded in part by a grant from the National Endowment for the Arts. Additional funding provided by the Boston Foundation for Architecture and individual donors. 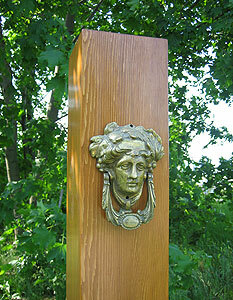 Andrea Thompson has mounted antique doorknockers on a series of posts 4 to 7 feet tall. Each post has a distinct resonant tone. The simple ritual of knocking builds a bridge between past and present, presence and absence, ourselves and those who have been here before us. The front door of a house marks a specific threshold: the boundary between our loved ones, within, and ourselves waiting outside. We knock, making the declaration: I am here, Ive come to see you. When we think of burial sites as final dwellings, however, we know that our friends will not answer our call. Yet we come here nevertheless, where our knock is answered only by the gentle silence of the landscape. Thus the unopenable door is here replaced with a sounding-box, a resonant voice set among living trees. The phrase knock on wood comes from the superstition that spirits live in trees and can be awakened with a knock, to listen as we make a wish. In this sculpture the knock becomes not a request to enter, but simply a request to be heard  we bring our memories and longing to the cemetery, and ask the spirit of the place to bear witness.